A blend of things I love, from mascara to mascarpone! What is it with everything at the moment!? Christ on a bike! The ‘I’m not dieting, I’m just eating healthily’ has well and truly taken a back seat these past few weeks, hence the lack of posting. I’ve just had no oomph to do anything! It’s been a struggle just to do the most menial tasks, like even getting up!! Things that have normally caused me joy, the cooking, the makeup, have been non existent! 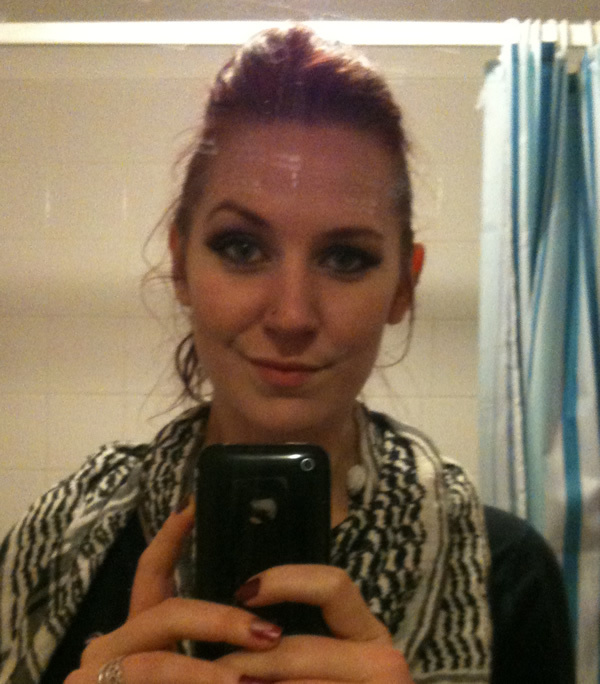 That’s right, I have had days these past few weeks when I’ve gone to work with no make up on! This may seem like nothing to some people, but to me it’s a big deal! Buuut, speaking to people, I’m not alone! How are you guys feeling? It might just be us Brits and the stupid ‘I look sunny and warm out but I’m freezing cold and going to randomly pelt you with hailstones that hurt so much it’ll make you cry’ weather. Honestly, this mass semi-depression can only be blamed on the weather, surely! Anyone I know who’s trying to diet, or eat healthily, have been knocking back the junk food. And I’m not kidding, I’ve lost count how much chocolate has disappeared down my neck recently, and I’m -not- a chocoholic at all! People I know who are fitness fanatics, are finding it hard to push themselves like they normally do!! It’s insane! But fear not, we’re not alone!! Knowing I wasn’t alone in my feeling down was the kick in the bum I needed! I headed off and got some cute storage bits and bobs for my makeup, sorted it all out so I no longer need to rummage through bags to find my foundation! I love it! It looks so organised, but still slightly chaotic, like me! The other half and I also grabbed a few bits to decorate our tiny hallway upstairs. That was fun, it’s now got a beach theme and freshly glossed doors! Check us out, huh! I also cooked what I can only describe as being a gloriously beautiful dinner! I’ve never cooked trout before, but we thought we’d try something new! 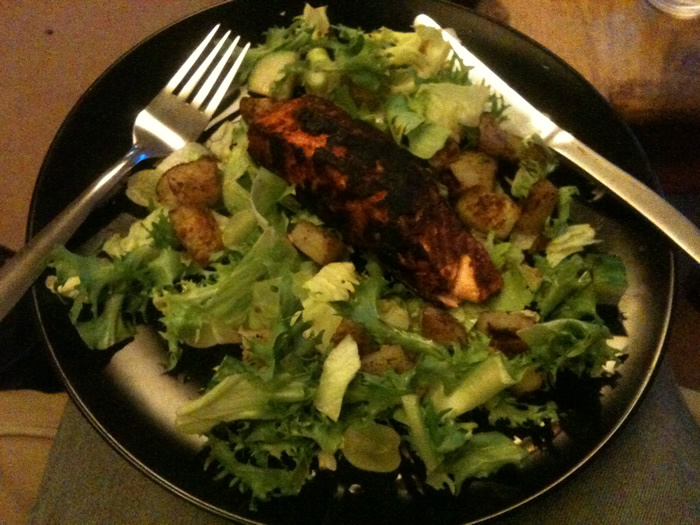 So I made something called ‘Blackened Fish’ on a bed of lettuce, with saute potato chunks and grapes. It was meant to have crap loads of butter in it, but I just missed that out and used it as a dry rub. It was literally like heaven to my taste buds! Here’s a picture of the finished product, because I’m vain like that! 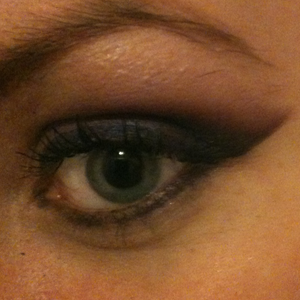 Speaking of vanity, I decided to buck up my ideas with the makeup yesterday, and actually made an effort for work. I don’t want to toot my own horn but I was really, really pleased with it!! 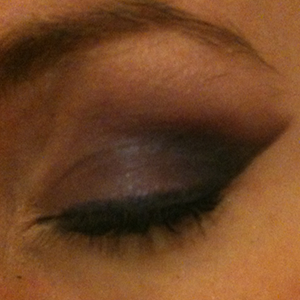 I think it would work as a prom eyeshadow, as it’s not too dramatic, but not too plain either. I felt like a right diva with my attempt at rocker hair. Please note, I do not claim to be any good at hair, so excuse it! So yeah, I think that’s everything! How have you guys been? If you’re feeling a little low, hope it changes for you soon!! So, a strange thing happened. I mentioned to a pair of lovely young ladies I know, that I was thinking about doing a tutorial for prom make up then I get home and low and behold, on facebook, I’m being invited to my ten year school reunion. Now, apart from feeling quite old now :(, I am taking it as a sign that this was meant to happen! Now, with prom just around the corner, I know there are going to be lots of young women out there planning what dress to wear, who they’ll be going with and, if things haven’t changed since I left school, some of the boys will be arranging the most unusual ways to arrive at the prom! Yes, at my school prom we had the standard limos, the fire engines, the horse drawn carriages, but we also had a lorry show up, complete with four portaloos strapped to the back, which four of the lads from my year emerged from. If I remember rightly, one had his pants around his ankles, and showed off his gold thong. Now, prom for me was a good night but… I don’t know, I didn’t really enjoy school so prom was more of a celebration for me that I had survived it! Looking back at the pictures… woof…. I won’t lie, I had a crap time in the run up to prom, with all of the preparation time being one thing going wrong after another. First bit of advice for you lovelies. PLAN!! Plan, plan, plan! You can never plan enough. Also, GO BY RECOMMENDATIONS! I made the mistake of getting some false nails put on by a company who had a stand in the middle of a shopping centre. Looking back on it now, I want to scream at myself! The woman was the dictionary definition of incompetant, she did seven nails using the white powder, then ran out and finished the others off in pink powder!! Now, correct me if I am wrong, but acrylic nail extensions are meant to be smooth, shiny, glorious things… well…. mine were not. They were lumpy, miscoloured, rough and different lengths. I got home, cried, then painted them over. I should have refused to pay her for such a shoddy job, but I was young. It didn’t stop me from feeling a little jolt of happiness when I watched them go bust a few years later! I really, hand on heart, do not want that to happen to anyone else. So, throughout the tutorial I might drop in a few things that I really wish I could have told myself! Actually, I really would like to do one of those ‘Dear 15 year old me’ letters, might be quite therapeutic! But anyway, back to my point. Wow I really do like to go off topic don’t I!? I could do with requests or inspirations for the make up style, for example would you prefer natural glam look or something more wild? Or both? Does my life not realise that I want to write! ?